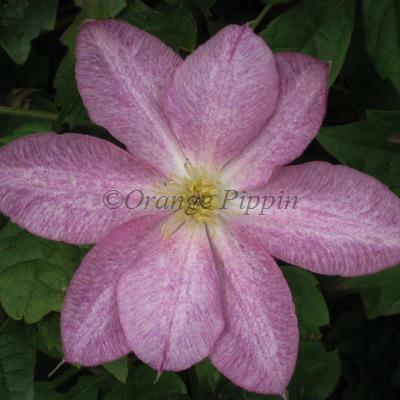 This large flowered Clematis has reddish-purple flowers with a paler stripe to each petals during May and June. Clematis 'Yatsuhashi', the name meaning 'eight bridges' is a non-evergreen climber which can be planted in the garden, grown up a trellis, pergola, fence, wall or planted in a container supported with bamboo canes or an obelisk on the patio. Clematis 'Yatsuhashi' was raised in Japan by Tetsuya Hirota in 1995. The name means 'eight bridges' and is also the name of a nursery famous for its cultivation of Iris laevigata.